a vast selesction of silk fabric for doll dressers and embroiderers. air hardening modelling material with numerous uses. 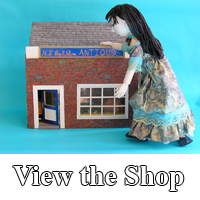 Lesley Shepherd’s resource site for miniaturists. Resource magazine for students with some job opportunities. Sally Brennan, unusual artist in full size and miniature. An artist working in full size from his London studio. Teresa Thompson’s cloth dolls in historical costume. Jane Davies collectable art in the form of dolls. Julie Campbell’s dolls, which you may recognise from a television advert! Linda Master’s incredible custom carved matchsticks and other wonders. Ken and Linda’s wonderful wooden turnings. Superior woodworking to look at and an invitation to chat about miniatures. Alan’s fantastic 48th scale furniture kits and a load of other lasered lovelies. Josephine’s bears as dolls’ house residents. Miniature knitting and knitting patterns by Helena Bleeker. Knitting and crotchet patterns to dress dolls throughout history. Wide range of nostalgic househoold products, handmade in miniature. Jane Woodham’s startlingly realistic miniatures, mostly authentic versions of actual artefacts. Julie Dewar is an accomplished writer and miniaturist living in Canada. Angelas’s online shop with some very keenly priced miniatures in smaller scales.